This isn’t the best photo of the Med, but I am in it (the dot in the middle) and as soon as I saw it today I remembered being there this time last year, bobbing about in the warm sparkling waters of the Med with the sun beating down. If the photo was a bit clearer you might see St Tropez in the far left of the picture, you’d also see that the blurry yachts and boats quite obviously belong to the rich and famous and finally you would see that I am in the sea with my beloved green foam banana which has followed me around France for the last 10 years. The Cote D’Azur has long been a playground of the rich and famous but what is perhaps less well-known, it’s also a campers paradise with campsites that cater for all tastes and some situated right on the beach cuddled up with the millionaires yachts and villas. Port Grimaud fulfilled the architect Francois Spoerys’ dream to build a Mediterranean village, inspired by the architecture of the area, on a former boggy wasteland. Construction began in the mid 1960’s and the result is what we see today – Bougainvillea covered pastel coloured villas alongside canals interspersed with leafy squares and the brightly coloured sun shades of restaurants and shops. It’s a great place to sit people watching as you sip a coffee by the canal or, if you’re feeling more adventurous, hire a little electric boat to explore the canals in. Be warned though, the steering on the boats takes some getting used to and we’ve often passed the time, standing on a bridge, watching the electric boats weave from side to side narrowly avoiding some expensive looking yachts! Along the beach towards Ste Maxime are 3 campsites, each with beach front pitches, where you can walk 20 paces from your pitch and be swimming in the sea. These are great sites for a beach holiday but expensive and extremely busy in the height of summer, so I’m not going to tell you about them, instead I’m going to tell you about Camping A La Ferme which we happened upon last year when just the 2 of us got 1 week child free and headed off for France in a banger of a Renault Clio and a 3 man dome tent from Tescos’. The site is situated just a 10 minute walk from the main coast road in Port Grimaud and the biggest campsite Praire De La Mer. Despite this you could be a million miles away from the general chaos that is the coast road in summer; the campsite is set among the vine yards slightly inland from the coast and it is owned by a very proud and meticulous owner who keeps all facilities spotless. The pitches aren’t massive but they all have shade and other than the ample shower/toilet facilities and a very small office, there is very little else on this small site. It is cheaper than the big sites, especially for couples and a perfect oasis of calm at the end of an action packed day at the beach. The owner’s name is Claude Ferrero, he doesn’t speak English so polish up your French if you want to book ahead. 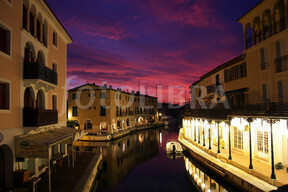 Port Grimaud is not to be confused with the town of Grimaud, the old town situated on a hillside inland. 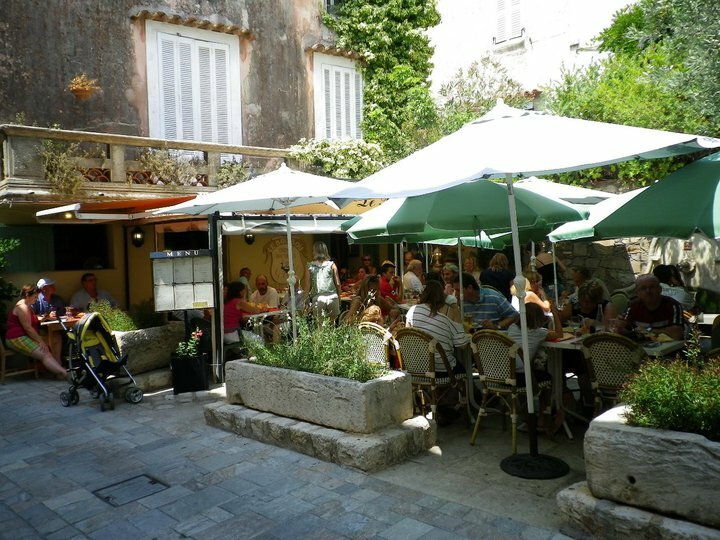 This is well worth a visit, the photo (right) shows a lovely restaurant situated in the typical Provencal town with narrow meandering streets and alleyways and old stone houses with brightly painted shutters. I took this photo just before the wine started having an effect, subsequent photos’ mainly showed peoples feet on the cobblestones. 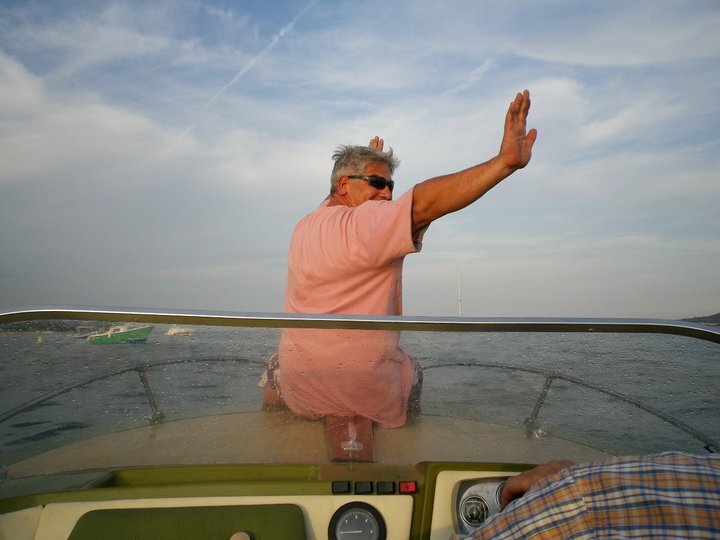 Bruce (left) on the front of a friends speed boat, dodging the millionaires yachts in the Bay of St. Tropez. Happy Days! Further eastwards along the Med coast, through Ste Maxime, St Aygulf and St Raphael you come to Agay on the Estoril coast. This is where my last nomination for cooler than cool campsite is situated. It is called Le Dramont – Campeole . It is a big site, right on the coast, but it has a really laid back feel about it. I chose this because of the beach; 1 sandy beach and, my favourite, one rocky beach. The rocky beach is excellent for rock pooling and snorkelling, or just clambering along the rocks to a small marina. The showers and toilets are plentiful and cleaned regularly and the site is situated near a train station where you can catch a train for Nice or Cannes or just nip into St Raphael. The red rocks of the Estoril coast are magnificent (best viewed from the sea in a boat) and if you want an adventurous drive you can follow the coast road to Cannes, which bends, twists and undulates all the way there. I have camped in Cannes before now and disliked it with a passion – a huge road to cross to a shingle beach and all very commercialised. Le Dramont is a million miles away from this but still within driving distance of the major towns in this part of the Med. These 2 sites conclude my Coolest Camping list for now – I will try to add a few more at a later date however it’s now only 2 weeks to go until we leave for France and to say I’m getting excited is an understatement. We’ve plenty to do in the next few weeks but I will try to keep the blog updated as I go. 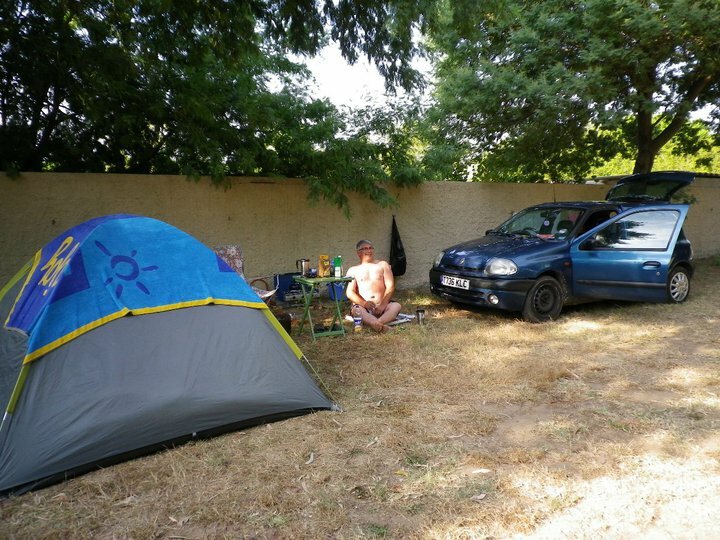 This entry was posted in Adventure, Books, Camp Sites, Camping, camping france, camping websites, cool camping, France, Tent, The Med and tagged Agay, Camping A La Ferme, Dramont, Grimaud, Port Grimaud, renault clio, St TRopez, Tesco tent, wine. Bookmark the permalink. Marge in France 2015 – Part 1: Before the holiday…..
I’m back and new adventure planned……. The Ardeche – France 2012 Part 3……………. Day 5 – Widmouth Bay & Day 6 – The Home Run……..
Day 4 – Shipwrecks, Cider & Seals………..